Gas giants must form a massive core before they can begin accreting gas, but how the process works has been a mystery for more than three decades. 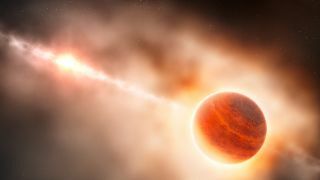 Material falling onto the core of a growing gas giant may provide the push needed to keep the newborn planet from spiraling into its star, new research suggests. The new discovery could solve the 30-year mystery of how gas giants such as Jupiter survive their formation period. The new study shows how heat from the falling material can create a force capable of pushing the evolving planet away from its sun. Koenigsberger was part of a team of scientists led by Pablo Benitez-Llambay, of the National University of Cordoba in Argentina, that simulated how this force affects developing gas giants in our solar system and beyond. "This tells us the conditions under which a planetary system, such as our solar system, can form," she told Space.com by email. The widely accepted model of gas-giant formation calls for a solid core to form from a disk of gas and dust orbiting a new star. In the crowded system, the young core constantly adds material from the disk around it to its growing mass. If this core grows fast enough, it can become massive enough to accrete gas and build a gas-giant planet before the gas dissipates over the first 10 million years of the disk's life. The gas giant Jupiter may be a familiar sight in the night sky, but how it forms continues to remain a mystery. The long-acknowledged problem, however, is that the growing core creates ripples in the disk that should cause it to spiral inward faster than it can grow. The cores may reach a stable orbit in the early solar system as "super-Earth" planets, or they may spiral into the star. In the new study, the scientists developed a simulation that revealed a new twist that could keep growing gas-giant cores from migrating inward in a death spiral. According to their research, as material from the disk falls toward the core, it releases heat. If this material strikes the core's surface, the crash produces heat, radiating energy away from the planet. This heat transfers to the gas near the planet. Due to the planet's rotation and the flow of the gas in the disk in orbit around the star, lobes of heated material form in front of and behind the young core. While the heat causes both lobes to expand and become less dense, the trailing region receives more heat, the researchers said. As a result, the growing embryo is pulled more forward than backward along its orbital path, creating what the study authors call a "heating torque" that ultimately pushes the young embryo outward, away from its sun. How much the growing planet is pushed outward depends on the disk itself. "Planetary systems such as ours can form only from disks in which there is sufficient solid material that, when being accreted by the protoplanet, can lead to a sufficiently large heating torque — one that can keep rocky planets from plunging towards the host star and can help embryos migrate outward beyond the snow line, where they can later accrete large quantities of gas and become gas giants," Koenigsberger said. The results, along with a corresponding News & Views article, were published online today (April 1) in the journal Nature. The complex process of gas-giant formation has long stumped astronomers due to the large variety of planets undergoing many physical changes. "We're trying to model processes that start with micron-sized dust particles and end up with bodies that are many thousands of kilometers or more in size," said Martin Duncan, a planetary scientist at Queen's University in Ontario. Duncan, who was not involved in the new research, authored the accompanying perspective piece. "These bodies collide, fragmenting in complicated cascades while growing in the midst of what is probably a turbulent gaseous environment," he told Space.com. The result is a computational nightmare when it comes to simulations, requiring numerous calculations performed in three dimensions over long timescales, all of which demands significant computing power to solve. "Even with the most modern and fastest computers, it is a nearly impossible task to run the models that include all the physics of the problem," Koenigsberger said. To alleviate some of the problems, she and her team focused on gas giants located beyond the snow line, the region where water ice changes from a gas to a liquid — a process known as condensation. They began with a core three times more massive than Earth located at the same distance from its star as Jupiter sits from the sun. "Three-Earth-mass cores correspond to these planetary masses that are problematic, because they systematically undergo fast inward migration," study co-author Frederic Masset, also of the Institute of Physical Sciences, told Space.com. Today, Jupiter has a core that is nearly 10 times the mass of Earth, but as study co-author Judit Szulagyi, of the University of Nice-Sophia Antipolis in France, pointed out, there must have been a point when it was only a third of that size, making for a good jumping-off point. From there, the researchers were able to simulate how the heating torque affected the migration of gas giants. "The amazingly diverse nature of the exoplanetary orbits and the structure of the planets on them force us to carefully examine our models of planet formation in an attempt to discern which of many complex and interrelated physical phenomena are likely to be most significant in shaping planetary-system architecture," Duncan wrote in his article. "The present study may well contribute an important ingredient to the mix."